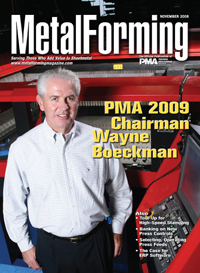 A degree in accounting along with 30-plus years behind the production whell of a variety of manufacturing companies has given 2009 PM Chairman ne Boeckman, president of Quick- Stampings, Inc. of Texas, a knack for knowing where and when to diversify. Metalforming companies, and PMA, need to follow his lead. This article quotes liberally from the book, High-Speed Stamping, by Dayton progress Corp., which address slug-control techniques and other tool-design criteria aimed specifically at improving quality and productivity of high-speed stamping operations. As stampers add components to press lines, controlling all of them can become quite a chore, testing the ability to maintain part production and conduct proper troubleshooting. Thats when a controls assessment and upgrade are in order. What advantages do air and servo feeds bring? Read on to find out which is best for your press-feed needs, and how you can get the most out of it. The 5-yr. plan for Apex Skypark, a manufacturer of robotic automobile-parking structures, calls for a 10-fold increase in sales. To keep pace, its metal-fabrication business leans heavily on an ERP system to effectively manage such skyrocketing expansion. Both have advantages in particular applications. Manifold systems are hardier and provide low pressure rise, and stand-alone or drop-in gas springs are ideal when pressure rise and environmental conditions are not concerns.